We chose Great Ocean Pools and Winstanley Landscapes to constuct our pool and to landscape our rear garden at our property in Armadale. 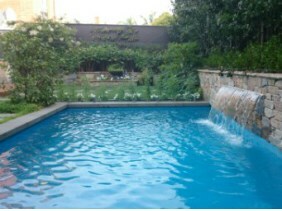 The design for the garden was done by David Bennett of Gardens and Pools by Design. 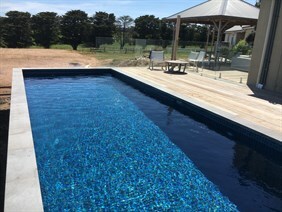 A number of factors were considered when choosing a company to construct our pool and garden, amongst them was the ability to interpret the design and to work in conjunction with the landscape designer as well as the capacity to unify the construction of the pool and garden. Demonstrated expertise in the construction of substantial retaining walls and paving was also a prime consideration. At the time of construction of the pool and landscape, major renovations were being undertaken on the house. Bruce's staff worked co-operatively with the builders on site and were approachable and willing to explain processes and meet with us on site at any time. Any unforseen issues were communicated to us and solutions were suggested for our consideration.The project was completed on time and within budget.We have no hesitation in recommending Great Ocean Pools and Winstanley Landscapes and we are now working with Bruce to construct our front garden.Thank you Bruce and your staff. When you decide to build a pool, it is a very daunting exercise due to the cost and concern as to whether it's all going to work out. When we met with Bruce Winstanley all our apprehension was put to rest immediately. Bruce is the owner of the business and we felt confident that he would oversee the job to its final completion. And that's exactly what happened. 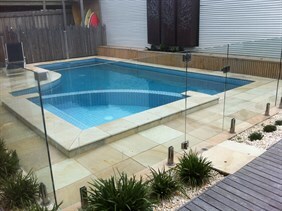 Great Ocean Pools created and built a fabulous pool for our home in Brighton East. Bruce's team worked solidly and in an exemplary manner to ensure that we would have the benefit of the pool as soon as he could possibly construct it. In fact they finished it before the nominated time frame. We would have no hesitation in recommending Great Ocean Pools in the future. Bruce and his team were fantastic to work with. We were very much the rookie clients, however with Bruce's industry knowledge and approachable, no mucking about attitude we felt very confident. Bruce always made himself contactable and was always getting straight back to us. Bruce organised additional trades for us to complete the deck, which we were thrilled with and all other trade staff and materials were organised by Bruce and his team. Bruce had a great relationship with our landscaper and the communications were always kept open. We are beyond thrilled. Bruce and his team completed a fairly major project for us in Torquay prior to the summer of 2010. The end product being a large inground concrete pool and spa was certainly excellent, but to me, as important was the very friendly and easy going nature of Bruce and his workers. They were open and easy to communicate with and my wife and I both felt very comfortable in the the way they encouraged us to be involved in the design process. 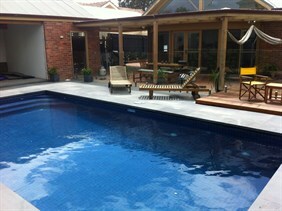 Another very important factor has been the excellent follow up service post pool completion. Bruce regularly made contact to see that all was going well. The pool itself is a feature of our newly constructed dwelling and draws much attention from our visitors and guests. I have no hesitation in referring Bruce and his company.